A worker has died after he got stuck in a piece of machinery used to cut metal at a Sharon, Massachusetts, business on Thursday morning. Fire officials said the 26-year-old man was conscious and speaking with first responders when emergency crews first arrived at the scene. His name has not been released. First responders rushed to the scene at Industrial Metal Products on Merchant Street in Sharon after receiving a call around 10 a.m.
Employees at the business said the object that the worker got trapped in was a machine that uses a laser to cut large slabs of metal. It took about an hour to extricate the man from the machine. Co-worker David Scott said he has used the same metal cutting machine involved in the accident. "I understand they had to disconnect machine parts and separate them and they're big and heavy and they tried using airbags at first, but that didn't work so they had to disassemble this machine," Scott said. Being familiar with the equipment, Scott said he was perplexed as to what could have happened. "It will run all weekend by itself so why in the middle of an operation he somehow got in between the loader and the laser? I have no idea what he could have been doing," said Scott. 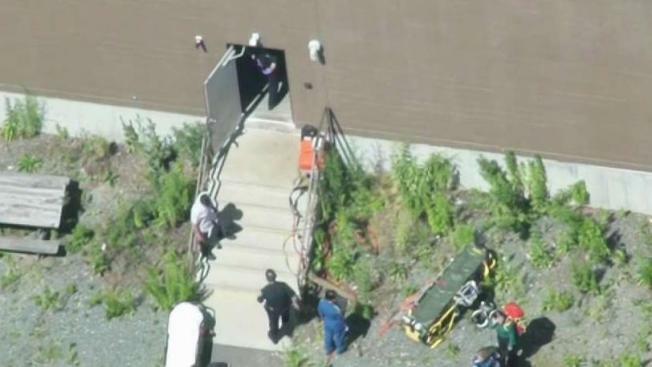 NBC10 Boston's Sky Ranger helicopter captured the moment when the victim was removed from the business and into an ambulance for treatment. A medical helicopter also responded, but police shut down part of Route 1 to transport the man by ambulance instead. Industrial Metal Products is also known as InMetal, and describes itself as "one of New England's leading providers of precision sheet metal fabrication and assembly." It says it won't have any comment. Police said the business closed for the day and the Occupational Safety and Health Administration is investigating. There is no history of accidents at the location.